The poor are the most vulnerable to the effects of climate change — yet under many proposals, they would also bear the biggest burden for attacking it. The socialist case for a carbon dividend — which would impose a tax on carbon emissions and then rebate the revenue in equal proportion back to the people — is that we can disrupt the dirty economy while reducing, rather than exacerbating, economic inequality. Critics of capitalism are understandably skeptical of market-based policies, which have had disastrous consequences in health and education. And a carbon tax is no panacea. It would be a complement, rather than a substitute, to democratic planning. But a carbon tax should be a central component of the “Green New Deal” championed by leftists like Alexandria Ocasio-Cortez. Pricing carbon emissions would change the calculations of businesses and local, state, and federal governments on a whole range of climate issues while strengthening the hand of activists fighting to block new fossil-fuel infrastructure, provide quality mass transportation, and invest in renewable energy. We cannot rapidly reduce carbon emissions without aggressively taxing the dirty fuels that produce them. 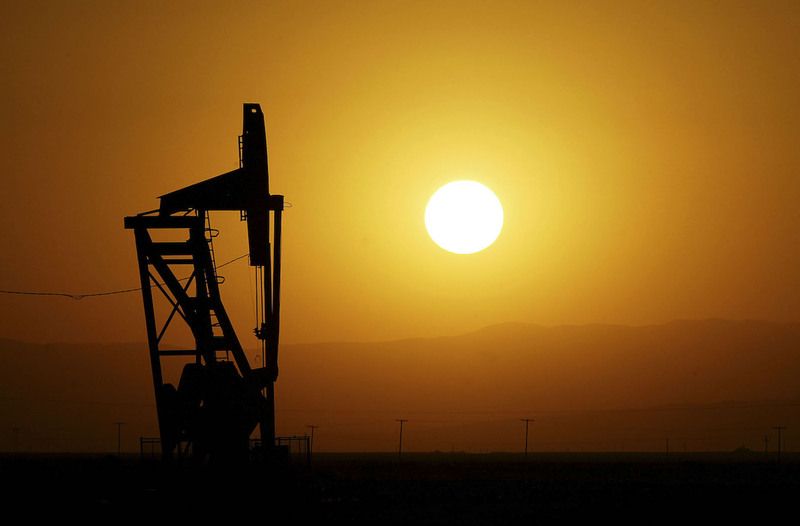 A carbon tax places a levy on fossil fuels where they are extracted or imported. Although the tax is nominally paid by fossil-fuel companies, the cost is ultimately passed on to consumers in the form of price increases proportional to the goods’ carbon content. For example, if a sizable carbon tax were imposed in the US, the price of gasoline would go up significantly — about $0.01 per gallon for every $1 charged per ton of CO2. The price of other goods, like bicycles or bus tickets, would also rise, but by much less. The biggest drawback of taxing carbon is that it burdens the poor more than the rich. This might seem counterintuitive, since the wealthy consume so much stuff. In the US, the average person in the richest decile emits about six times as much CO2 as the average person in the poorest decile. But the incomes and expenditures of the richest decile are more than six times those of the poorest decile, so a carbon tax would reduce the standard of living of the poor more than the rich. That’s where the dividend comes in. After hoovering up the (quite substantial) revenue that would be raised, a carbon dividend would then be paid out to everyone, ameliorating the tax’s regressivity and smoothing the transition to a green economy. Why should the dividend be universal? Why not just send a check to the poorest families? First, it’s the right thing to do ethically: the environment’s capacity as a carbon sink belongs to everyone in equal measure, so everyone should receive an equal share of the revenue raised from its use. And second, it’s smart politically. Programs that provide everyone with an equal share of the benefits, like Norway’s Government Pension Fund and Alaska’s Permanent Fund, are massively popular. And unlike the programs in Norway and Alaska, a carbon dividend would be funded by the conservation, rather than the extraction, of fossil fuels. In a report out today from People’s Policy Project, we ask what a reasonable policy response would be if we took climate scientists seriously. While conservative carbon taxes have been proposed, usually in the realm of $20 to $50 per ton of CO2, we advocate a carbon tax more in line with the scale of the problem: $230 per ton in the US. This is what would be necessary to prevent global temperatures from rising by more than 2.5 degrees C.
By our calculations, a tax of this size would increase gasoline prices by 79 percent, to approximately European levels. It would also raise the price of electricity by 51 percent, airfare by 23 percent, and groceries by 9 percent. These increases would of course be a burden, especially for poor families. But a carbon tax of this size would also raise hundreds of billions of dollars — enough to fund an annual carbon dividend of $2,237 for every person in the US, or nearly $9,000 for a family of four. A carbon dividend would increase the purchasing power of most people, including the vast majority of people in the bottom half of the distribution. For example, the average person in the poorest decile would see their expenses increase by $866 a year, but with the dividend they’d enjoy a net benefit of $1,371. Meanwhile, the average person in the richest decile would pay twice as much as the dividend, incurring a net cost of $2,501. 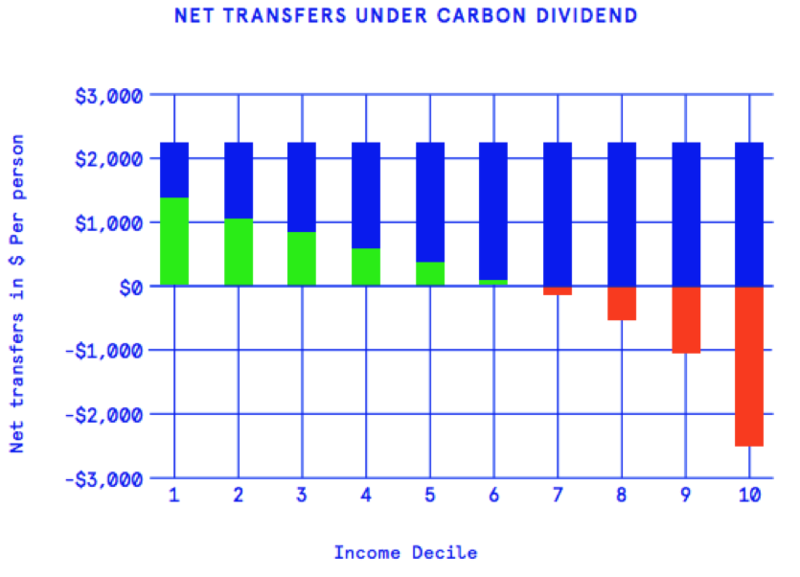 As shown in the figure below, a carbon dividend would actually raise the standard of living of the average person in the bottom 60 percent of the income distribution. Not unrelatedly, a carbon dividend would also benefit the vast majority of black and Hispanic Americans. Our analysis suggests that a carbon dividend would also improve the wellbeing of a slim majority of people living in rural areas. Climate change is the problem of our time, and it’s time to take action. While a carbon tax should not be viewed as a cure-all, socialists should embrace it as a powerful tool to reclaim common ownership over our collective resources — the carbon sink capacity of the atmosphere — and reduce our emissions as rapidly as possible. Some climate activists argue that carbon tax revenue should be devoted to public investment aimed at cutting emissions. We think this is mistaken. We strongly advocate for the state to invest in green projects as part of a comprehensive Green New Deal, including policies to build a twenty-first century power grid and transportation system, support major investments in research and development for green technologies, and upgrade our existing homes and buildings through energy efficiency investments. But using a regressive tax to build the green future is bad policy and bad politics. It would undermine any chance of public support, pushing austerity on those least responsible for the climate crisis. Instead of shying away from a carbon tax, socialists should embrace it — and push for a higher tax rate and a larger dividend that will complement public investments. A serious carbon tax, coupled with a universal dividend, can serve as a central component of a Green New Deal that would move us toward a more sustainable and equitable economy. Anders Fremstad is an assistant professor of economics at Colorado State University.